The weekend after Alex's 25th Geburtstag, we ventured to Düren, a small city on the river Rur between Aachen and Köln. Only about 40 minutes away by train, Düren made a nice birthday/Valentine's Day weekend getaway. The name Düren is derived from Durum, the Celtic word for castle. The town changed hands among Germanic tribes before ultimately being conquered by the Romans under Julius Caeser. Today, Düren is known for housing the paper industry beginning in the 17th century. Alex and I were excited to visit das Papiermuseum on our trip, but were disappointed to find that das Museum is closed for renovations until late 2017! Despite the disappointment in not being able to enjoy the planned core of our trip, we had a great time. While in Düren, we stayed at Düren's Post Hotel, a family establishment that opened in 1988. The building has the charm of an older hotel with the comforts of a recently renovated one (including modern bathrooms). The halls are lined with old sofas and cabinets, but the rooms are cozy with fresh sheets and fluffy pillows. For the rainy, miserably cold weekend, the Düren's Post Hotel was a great place to stay in bed and watch Netflix with Gummibären and hot tea. Between episodes of Lost on Netflix, Alex and I bundled up to face the freezing wind between rain showers. Although visiting das Papiermuseum was a bust, we accomplished a lot on our trip. We saw some cool old buildings, passed some neat sculptures, and had the most success we've had while in Germany while shopping. Our first bit of success came when finding one of Alex's birthday presents: a pair of Birkenstock Sandalen. Despite Birkenstocks being a German product and being told we "can find them anywhere," tracking down a pair of these robust, fitted shoes has been anything but easy. Our luck, however, changed in Düren when we found the perfect pair—and at half the price of what they go for imported to the States! The second piece of shopping success came at H&M, one of the few clothing department stores in Germany. While there are some stores similar to Boscov's, JCPenny, or Kohl's, they are few and far between. This has been a nightmare for me because finding Umstandsmode has been impossible. In Düren I saw (and bought) my first pieces of maternity clothing (from a very limited selection). Of course, being from H&M, most of the clothes available were in the form of skinny jeans, which I couldn't pull off even if I weren't pregnant. So I settled for some nice leggings and a button down shirt. After the clothing successes for both Alex and myself, it was time for shopping attempt number three: baby souvenirs. Alex and I went to a toy store in hopes of finding 1. FC Köln goodies, and once again, we struck gold. We bought Baby a bottle and set of pacifiers, both with the football team's mascot, Hennes the billy goat. We also got the baby a pillow in the shape of a goat (which I am certain is more for Alex than the baby). 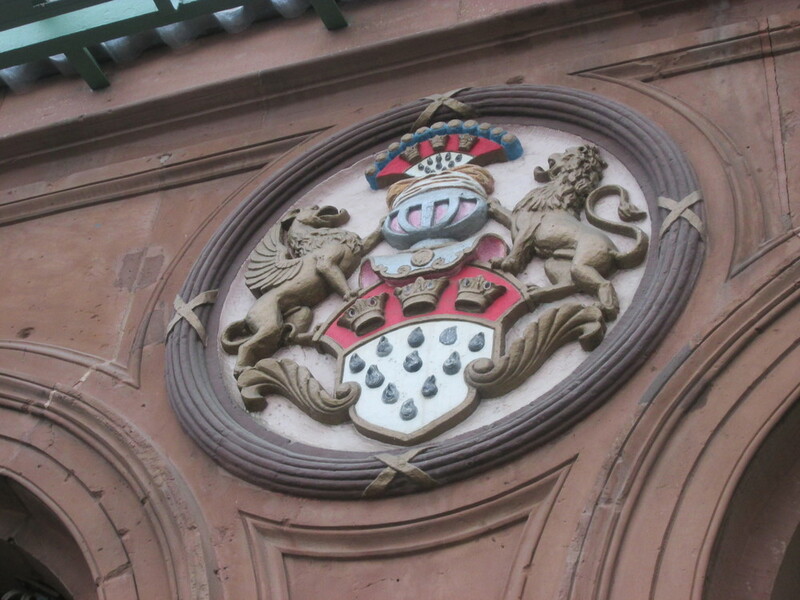 Seal above the entrance to Düren Bahnhof, featuring the crest of Köln (red and white shield featuring three crowns). Perhaps my favorite part of the whole trip was the bed. Being in my seventh month of pregnancy, the most frustrating part of my day is waking up in our apartment in a bed that is about 40 centimeters (about 1.3 feet) off the ground. Sleeping in a bed about twice that height was nothing short of fantastisch (and it made me feel like a 22-year-old rather than 50 years older).